Emory's James Wagner drew outrage after citing a compromise that counted three-fifths of slaves for representational purposes. (CNN) - Published over the weekend, Emory University President James Wagner's winter message reflected on the importance of compromise in politically divided times. The example he chose to illustrate his point, however, was rather unfortunate. And before the weekend was over, he was apologizing for citing the so-called three-fifths compromise in which Northern and Southern states agreed to count three-fifths of the slave population for determining representation. "A number of people have raised questions regarding part of my essay in the most recent issue of Emory Magazine," Wagner wrote in an apology posted above his original column. "Certainly, I do not consider slavery anything but heinous, repulsive, repugnant, and inhuman," he said. "I should have stated that fact clearly in my essay. I am sorry for the hurt caused by not communicating more clearly my own beliefs. To those hurt or confused by my clumsiness and insensitivity, please forgive me." The apology came after comments lit up social media. Let's just say some people were downright offended. If you were on Twitter, you probably saw all the chatter. It was hard to miss. Would say #Emory prez 3/5 of a prez but why compromise? Can him! The Wonkette's headline said this: "It Is Cute When White People Try to Have Thoughts About Slavery"
And in Gawker: "Foot goes where? In mouth. In mouth, sir." Several professors from Emory University's history and African-American studies departments spent hours over the weekend refining a letter of their own to Wagner. That letter, along with an editorial is slated to be published in the school's newspaper, The Emory Wheel, early Tuesday. "The use of the Three-Fifths Compromise for any reason is unacceptable because, regardless of the context of the compromise, African-Americans see it simply as looking at black people as less than a human being," said Leroy Davis, one of the professors who helped pen the letter. "We felt it was necessary to point this out," he said. He said the letter, however, does not call on Wagner to step down, like some had done on Twitter. "I honestly believe he did not recognize how insensitive that compromise was to many people," Davis said. In his original column, Wagner held up the three-fifths compromise as a shining example of working together. "As the price for achieving the ultimate aim of the Constitution - 'to form a more perfect union' - the two sides compromised on this immediate issue of how to count slaves in the new nation. Pragmatic half-victories kept in view the higher aspiration of drawing the country more closely together." "The point was not that this particular compromise was a good thing in itself. It was a repugnant compromise. Of course it is not good to count one human being as three-fifths of another or, more egregiously, as not human at all, but property. Rather, the first point of the essay was that the Constitution had to be a deeply compromised document in order to be adopted at all. If something is compromised it is inherently weak, unstable. In the Constitution’s case, that weakness resulted in ongoing struggles over slavery and, eventually, civil war. In the long run, critical amendments have helped resolve some of the document’s weaknesses and instabilities. We are still working at it." Post-doctoral fellow Erich Nunn, who is teaching a class on race and music this semester, said Wagner's comments were "jaw-dropping, a parody." He found it ironic that Wagner's faux-pas came as part of a column that Nunn called an "obtuse" effort to defend cuts in liberal arts funding. "After my initial response I thought it was revealing," Nunn said. "It demonstrates the necessity of the liberal arts." That no one associated with the production of Emory Magazine questioned Wagner's column was disturbing to Nunn. "A real lack of critical thinking has been revealed by this whole debacle," he said. He plans to discuss the matter with students when class resumes Tuesday, make it a teachable moment. The outrage over Wagner's comments came as Emory announced its commencement speaker this year - none other than Rita Dove, America's first black poet laureate. Emory is a complete scam. I wish the parents could see how many kids are on drugs, and how many stupid things they do. An cheating is way out of hand in the undergrad portion. True emory has a great law, business, and medical program but Emory undergrad is a complete scam. I know of many cases where the Emory PD as caught kids with drugs and gave them no suspension because the PREZ doesnt want the world to know about all the drugs that go through the campus. Aderol is a joke they pop that stuff like tic tacs. Xanex an ecstasy and molly are everywhere on the campus. Juss go to frat row you will find it. Especially in Sig Nu or Beta. Trust me do your research. Some of you tired of having "Polically Correct" shoved down your throats? This is required because of the stupid mistakes that were "acceptable" by the majority for so long. 99% of this country doesn't know what the 3/5 comprise even was. Here we go with yet another instance of people jumping in on the 3/5 compromise without understanding what its even about. The North was completely right and justified in their refusal to give full acknowledgment in accounting for the slave population. It shouldn't even have been 3/5. It should have been 0/5, which the North wanted, but they couldn't get the South to give it up, and had to compromise. 3/5. Full representation would have been total BS. Understand, the Norths opposition to full representation and the 3/5 rule WAS NOT the North calling slaves "3/5s of a man" as people continually misquote. It was the North telling the Southern states that they were not going to allow the South to try and claim voting representatives in congress on behalf of people whom the South did not actually allow to voice an opinion at all. What the South wanted would have been the equivalent of letting Southern slave owners cast an extra vote for every slave owned. The North wasn't letting them pull that scam. But people don't want to hear facts these days. They'd rather get themselves in a rabid froth over things they have no understanding of. Wagner's PHD is in engineering. This gaff reflect the value of making even those folks take a few humanities courses. HAHAHA, you've got to be kidding me. Society's freaking doomed. Political correctness has gone too far. From my (considerable) experience in higher education, University Presidents are mostly useless. Ditch them and put their salaries back into roles with direct impact on students. WOW...the political correctness fascists have really been given a bullhorn with mass media and the internet. God forbid ANYONE be offended by ANYTHING! Grow some cohones, people, and stop being such a bunch of whiners. The most disgusting part about this is that anyone was offended at all. Referencing history should never be a reason to berate anyone. If the negotiated agreement itself is what bothers you, then fine, but to say "he referenced this, so he must have meant that" is incredibly ignorant. You cannot be offended unless you allow something to offend you. To be offensive the desire to offend must be present. Being offended at something that was never intended, and you all know what the intent was, to be offensive is a demonstration in hate ethics. Of all the educated ppl that responses negatively, I am absolutely shocked. But what's new. Jumping down the throat of a white man for non-racist words is an everyday occurance. Obviously even the most educated still can't decider between what is racist and what is not. Glad to see that ignorance is still going strong. Maybe if you try harder, next time you can destroy this guys life entirely. How awesome for you would it be to exact your made up revenge by getting him fired and excommunicated from his field?! It is sad that politicians get the prime positions. Ok, it was a false compromise in a veiled attempt to gain political power. So its not really a good example of compromise but it is a great example of political maneuvers. It was surely a "Compromise" and just as surely a great example of why Compromise never yields great, good or for that matter reasonable solutions. Compromise is just being willing to accept poor solution and never solves a problem, just puts it aside for another day. He committed no offense by using it as and example since the result of the compromise done nothing to improve anything, just swept it under the rug. This is the problem of legislation by compromise, each side comes to the table with unreasonable demands and then wants the other to honor the proposal by compromising in it's direction. Just a very bad way to run anything. It simply says that we will settle for a bad solution. This is how Washington works, on both sides of the aisle. It is important to note that had slaves been counted as more than 3/5 then the south would have had more represetatives in congress and slavery would have never gone away. You can thank some sneeky Abolitionists. The NORTH wanted 0/5 slaves represented and the SOUTH wanted 5/5 slaves represented. NOT the other way around. They compromised with a 3/5 and became more united as a result. BEFORE this compromise, NO slaves were represented. It went from NONE to 3/5. which is a GOOD START IN THE RIGHT DIRECTION during this time period. OF COURSE 5/5 is best, but you don't suddenly get amazing results without taking some smaller steps in between!! It DOES NOT mean those smaller steps are what is desired as a FINAL result. The point is that we need to start compromising TOWARDS the right direction. Otherwise, we might not even move forward at all. Let's not pretend like the south wanted to count slaves as whole people because they actually valued them as people. The south wanted to rule and knew it could use its slaves to gain more (racist) power. And the north didn't wnat this to happen, so they found a compromise, on the growth of the racist small mindness of the south. This being so, let's not celebrate the fact slaves went from 0/5 to 3/5 of a person because in all actuality, it only happened for the wrong racist reasons. Wagner's words – unnaceptable. Sorry, but neither side of the compromise gave the Saves anything. They still had zero representation. Yes Zero, not 3/5. They got no vote, not representatives. The issue was as to how many members of the House of Representatives a state would have and as to how many electoral vote the state could cast. Like I said it meant squat to the Slaves. It gave the Southern plantation owners more political power, and gave the Slaves nothing. That's actually a start in the WRONG direction. Slaves were NEVER represented. The slaves didn't get to vote on issues. they didn't get to elect representatives. They got ZERO say in anything in southern politics. This is why they should have gotten 0 representation in congress. Because any congressman allotted to the southern states on behalf of the slave population, was not representing those slaves at all, and would really have been giving second and third votes to slave owners. Dr. Wagner’s statement was an example of a political fact that occurred. I am a black female, Emory alum who has two daughters are also Emory alums and we not at all offended by the article and the example that Dr. Wagner used. Please do not use as a spokesperson for black American the white female Emory faculty member. Using her is more offensive than the example stated by the President. I can well able to speak for myself and she was wrong, not Dr. Wagner. Emory-an anachronistic, academic cotton patch of fake racial apologism by old-money mint-julepers playing at being highly lettered in southern historical fetishes, not much to talk about around the dinner tables of the rest of the world. Wow. Sounds like a jealous Kennesaw State grad or someone that didn't get admitted. I am stunned.. Why apologize for accurately describing history? Whether you agree with the outcome or not (nobody today would), the 3/5 compromise was a masterpiece of pragmatism for the sake of national unity. Without it, the 13 colonies might have gone their separate ways and formed regional confederations instead of the USA. We can not change history; arguing over this compromise as if it's a bill in Congress today is ludicrous. I would disagree. The point of a University liberal education is to think and debate such things. It is to be exposed to challenging ideas and thoughts that you may disagree with and learn to evaluate. Then either modify your view, or learn to defend yours, respecting others. I fear that is no longer the point of a University education. We learn from history by such debates. We should not accept history as a series of pure and proven facts. A white man saying something racist that's not surprising. If they didn't say something racist I would be surprise. A non-white person stereotyping and then calling them rascist. Do you not see the flaw in your OWN logic? No problem with his comments at all. The act was a great compromise. I view the situation as similar to the "Just" memo that is used in Engineering disciplines as a teaching aide, for those who are not familiar, it is an engineering memo written about a process improvement that yielded vastly improved results. Often cited as one of the most complete, well written memos available for teaching, there is only one problem: the "process" was Nazis gassing prisoners. One can learn from bad things, if one can get over the idea that by mentioning such things, you are not automatically condoning such things. He stated a fact of American History to illustrate a point, no harm no foul!! Nobody ever said history was all good there are bad things that have happen and both will continue to happen to shape our nation. So why rip a person down for speaking the truth and using his 1st amendment right to do so. 3/5 was a compromise that was made in our government a fact that unfortunately cannot be disputed!! Sure, it would have been better if he'd used a more recent example of Congress working out a compromise, but there haven't been any since 1994. Academically, he was spot on, though he should have better included in the original point, knowing it might be controversial, that he was not saying the compromise was "moral" or "good" or even "humane," but merely that, in terms of founding a new nation, those who disagreed took an item that could have single-handedly undermined the entire effort and found some sort of "common ground" in order to continue moving toward the greater goal. Not that the common ground was ethically proper, especially looking back, but that it was divisive–even in its own time–and yet they found a way–in THAT time and context–to get past it and move forward. so the only example of compromise in American society that is in people's minds is Slavery. really! I can think of so much more, but with a Black Presidnet of the USA and a Black Attorney General, I can understanbd how Black is on the mind of whites today. Interesting after 400 years of White Presidents we never spoke about Whites like this. Very tellling of Racism in America and America's inability to speak about racism openly and honestly. Whites lie about their feelings of race, and this article is an example of that lie. It's 2013. Get a calendar. He made a clumsy, stupid, offensive comment. Give him a break! The man's an Engineer for gosh sake! Of course he's going to be socially maladroit. neither side of my family got here until the early 1900s, so we had no part in slavery. but when black people look at the color of my skin and blame my family for slavery based on what i look like, without knowing my family history, do you know what that is called? Yep. Racism. Not just for white people anymore. Things will improve now that you've announced your victimhood. It's also super cute when liberals or African Americans try to call white people out for talking about slavery. Unless you are some sort of omnipotent time lord...YOU WEREN'T THERE EITHER!!! What makes your opinion more valid than anyone else's? It's also super cute when conservatives try to call liberals out for talking about gun control. Unless you are some sort of omnipotent time lord...YOU WEREN'T THERE EITHER!!! What makes your opinion more valid than anyone else's? See how that works? slavery is attached to a time period. Gun control is not, thus you can't "have been there". Gun control is also not divided among party lines in the way slavery is divided among racial lines. Point is, your reply makes zero logical sense. The White society is not talking about slavery they noted how the 3/5's rule was apprporiate. Just as Blacks thought slavery was an intention of a white society and they still like it, or it would not be making the news with reports of states finally abolishing slavery and presidents of Universities writing abaout slavery and it's compromise in society. Lets have White slavery for 400 years and see how that fits your history lessons. OK but sticking with the subject, in your mind, which would have been a better solution: 1/5. 2/5, 3/5, 4/5 or 5/5? The starting point was 0/0 for the South and 1/1 for the North. 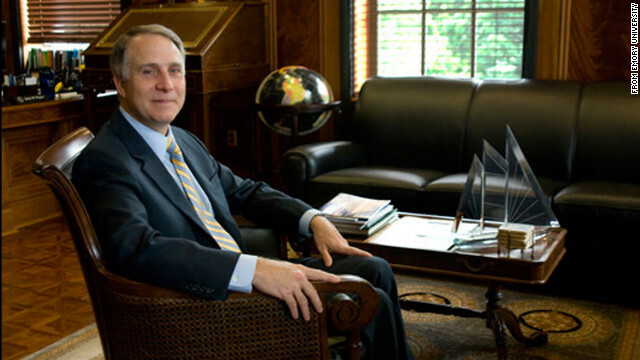 The Emory president was insensitive and the 3/5 compromise wasn't America's finest moment. But, say, now that we are having an open dialogue on race and socially acceptable behavior, I'm kind of offended by all the murders, robberies, rapes, and car burglaries that occur downtown. Not being a fine moment is the whole point. Nevertheless it had to be dealt with. This shows you how stupid the professors at Emory are. The 3/5 Compromise acted to forbid the South to use 5/5 of its slaves to be counted as free citizens when it came to the Southern states sending representatives to Washington. The compromise, in lieu of a secession and perhaps Civil War, was that the South would be allowed to only count 60% of its slaves towards representation. It had absolutely nothing to do with saying blacks were 3/5 human. This is typical politically correct idiocy. No way this guy should be apologizing for anything. We can't say the 3/5 COMPROMISE was a COMPROMISE? And that COMPROMISES, in this case anti-slavery, have value, or that the compromise had value that eroded the political power of the South? Idiots, wake up. The 3/5 Compromise did not mean slaves were worth 3/5 of a non slave. The Southern representatives wanted to count all the slaves for representation purposes. The anti slavery representatives did not want slaves to count at all, or at a lower ration than 3/5 at any rate. The more slaves counted, especially because they could not vote, the more the power of the white population in the South and over national issues. "Now that Mississippi has finally ratified the 13th Amendment, which means slavery is now offically over in America. We now need to ratify another amendment to free the minds of those that still see us as good for nothing but slavery." And once again, my alma mater makes the news headlines for reasons not at all positive. Fruedian slip to the max. President Wagner should have known better. Case closed. What heck............Wagner must be a conservative to get this kind of flak. You might wanna look up the definition of "Freudian slip." He didn't accidentally say butter instead of bread. The guy published an entire opinion piece on the topic. people were "offended" this "offended" is as serious when the UN says another nation is "a threat to a safe world." Next! Bunch of pansies finding reasons to whine over nothing. blah blah blah , blah blah blah.....does anyone (with a brain) give a hoot about this???? I feel for that guy, although I'd bet he's as liberal as they come, so to him I say – welcome to the world you created, sir! That's a rather lazy, insensitive, ignorant way of looking at this issue, richintexas. Only in touchy-feely, instant-outrage, I-have-the-right-never-to-be-offended-by-anything-anywhere-at-any-time modern America would a sober article that referenced a major factual event in American history somehow be considered evidence that the 21st century author of said article supports slavery. Nothing in his original comment was racist at all. He cited a major compromise during the dealing of the Consitiution which was make or break between the South and the North. Other than the Bill of Rights, it was the most important compromise to get the Constitution ratified. Yes, anything to do with slavery was immoral, but his comment did not invoke racist ideas at all. Only people who viewed it through racial undertones saw it as racist. That is wrong with society today. Everything has to be PC not to offend anyone. Sorry but history does offend people from time to time. Doesn't mean we can't talk about them. Do we strike all history which offends a race of people? Then most history would be gone. No Holocost, no slavery, any history concerning the wiping out of Native Americans, etc. If all of this was striken, then we are doomed to repeat it. The people most offended by history are those who are usually on the losing end of it. The Black population, the Native Americans, the South, the poor. I think its racist that I have to apologize for things white people who aren't even my ancestors did generations ago. I suppose Chris you have a lot of guilt? Being native my self I could really care less about you and your apologies or lack there of. In fact, I don't need it. But to turn blind ignorance to the fact that, as I said in a previous comment to you, the whole sale genocide and racism of the past still affects minorities of today is ludicrous. We don't want your apology, and I'm more than willing to tell you where to put that apology. But to have people like you claiming that those atrocities of the not so distant past no longer affect our positions in life is offensive and just plain ignorant. But I'd be the first person to admit that the only way you will understand is if you and your people are enslaved and put through genocidal treatment for several centuries. I can say with sincerity that I hope your nor anyone else ever have to endure that kind of pain. I am getting so sick of our LACK OF FREEDOM OF SPEECH. Do we not mention slavery and pretend it never happened? Or do we state facts? Why should anyone have to apologize for stating their thoughts, it's getting to be outrageous. Look how the blacks have their own music awards? If whites did that, it would be called racism. It's only the whites who can't do that, but the blacks can, ohhhh, It's time we stopped apologizing for facts and our thought we have about history. Let the blacks grow up, it's about time. Let them stay in school, didn't M.L. King fight for that and die for that? Yet they only quote him when it's to their advantage, not something they practice. Wow...I can see all of the logical fallacies, false claims of reverse racism/discrimination and general anti-black sentiment in your post. It is this nonsense that you spew (and many others) that keeps the topic of racial tension in this country a poorly-understood issue. Country music awards?? 🙂 You fail to recognize that whites don't need the things you mention, society is based around you. everyday life is presented in your image. In fact, picture the "typical" American family, what do you see. Yes this is changing, especially today. But until the "image" of what being American is, changes. Minorities will need representation where there is none. I for one have no issue with whites having their own areas of focus, as long as the white robes and burning crosses don't start coming through, I could care less. He did nothing more than state a fact. Facts sometimes offend. Free speech. Get over it. Move on. Great compromise unless you were a slave. That is really completely untrue. The 'three fifths' was a means to try to establish representation. It had absolutely zero impact on the day to day life of a recently freed slave. Had this specific measure not been adopted, one of two things would have: either the northern states would not have accepted the Constitution at all, or there would have been some other means devised to establish representation. There is no doubt that freed slaves were mistreated long after the Civil War. There are still racist overtones to elections this very day. But this specific action did not deny any individual and specific right. It did not impact their day to day lives. It merely set rules for counting the electorate. Not dissimilar things happen today, when college students or military are not allowed to vote in thee region in which they are currently sleeping, because one side feels that it would give a disproportionate skew to the local population. The point that Wagner made is actually precisely correct. People are offended only if they want to be, and because they do not care enough about the history of their own people to take a moment to actually read a history book. What in the hell are you talking about? The three-fifths compromise was negotiated in 1787. There weren't a whole lot of "recently freed slaves" then. There were a hell of a lot of slaves, though. "Teachable moment" is a patronizing phrase. I wish it would die. I might agree...but its well-deserved in this case, wouldnt you say? What do you consider "teachable" about this incident? The only thing I can think of is that it's apparently no longer ok to mention factual, objective events that have taken place in American history, lest somebody somewhere go from zero to outraged faster than a speeding train. Mathew, it was an opinion piece that went beyond stating objective facts. He held it up as a good example of compromise, when in fact, what was agreed to was something that should never be subject to compromise.